CINCINNATI — Duke Energy officials said Wednesday they would take extra time to consider whether or not to install a proposed but controversial new natural gas pipeline project. Duke officials announced the extension following a town hall meeting held earlier this month to give residents the opportunity to ask questions and raise concerns about the proposed 30-inch, 12-to-14-mile pipeline, known as the Central Corridor Pipeline Extension. The meeting yielded more than 1,300 comments, according to Duke spokeswoman Sally Thelen. The line would run through northern Hamilton County, replacing a pipe that has been in place since the 1950s. Jim Henning, who oversees Duke’s Ohio and Kentucky region, said the number of comments prompted leaders to pause and give the decision more consideration. “Our goal is to have the best possible plan with the least impact on property owners, the environment and the communities we serve,” Henning said in a statement Wednesday. 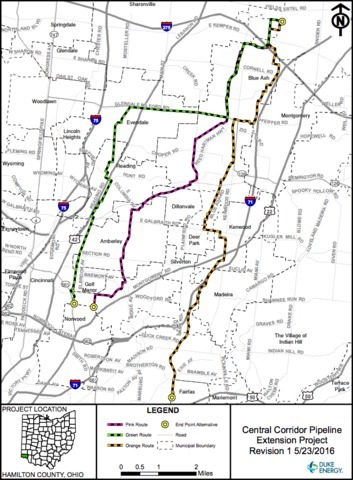 Before this month’s listening session, the company had proposed three different routes for the pipe. WCPO's Tom McKee and James Leggate contributed to this report.